Baked chicken breast topped with skinny basil pesto, tomatoes and garlic. Quick and easy! Marinate chicken in lemon juice, salt and pepper. Fry with MCT OR COCONUT oil in a pan until lightly browned and cooked thoroughly. For the pesto sauce, puree fresh basil, garlic, chicken broth, and lemon juice in a food processor. Add pesto mixture to chicken, add a little water and cook on medium heat coating chicken with pesto mixture. 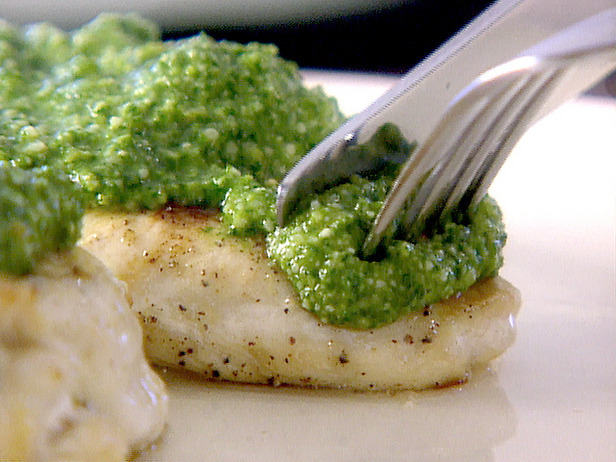 Pesto sauce may be made by itself and added to vegetables or other protein options.